Actor Edmund Purdom -- whose initial stardom in the stodgy 20th Century-Fox epics THE EGYPTIAN and THE PRODIGAL gave way to a lengthy career in international co-productions and dubbing gigs -- died January 1, 2009, in Rome, at the age of 84. Born in Hertfordshire, England in 1924, Purdom's early work as a Fox contract player landed him minor bits in TITANIC and JULIUS CAESAR but, more importantly, put him in the right place at the right time. In 1954, when Mario Lanza put on too much weight to carry THE STUDENT PRINCE, director Richard Thorpe put Purdom in the lead, and when his JULIUS CAESAR co-star Marlon Brando pulled out of THE EGYPTIAN, Purdom rode that opportunity to a brief-lived stardom. His star then descended fast: He was named the 1954 recipient of the Golden Apple Awards' "Sour Apple" as "Least Cooperative Actor" and, by 1957, he was back in England working on the TV series SWORD OF FREEDOM. Two years later, he was doing anonymous voice work for THE DIARY OF ANNE FRANK. Much like Cameron Mitchell, Purdom found Rome to be a rich playground of opportunity for actors disregarded by Hollywood. His Italian career began with Riccardo Freda's TRAPPED IN TANGIERS (1957) and would eventually encompass some of the best, worst and most intriguing Italian pictures of his time: FURY OF THE PAGANS, NEFERTITI OF THE NILE, Sergio Corbucci's 1966 remake of THE MAN WHO LAUGHS, Pupi Avati's THOMAS E GLI INDEMONIATI, Jess Franco's LOS OJOS SINIESTROS DEL DR. ORLOFF and UN CAPITAN DE QUINZE ANOS, DR. FRANKENSTEIN'S CASTLE OF FREAKS, Massimo Dallamano's THE CURSED MEDALLION, MR. SCARFACE, Umberto Lenzi's riotous CITY OF THE WALKING DEAD aka NIGHTMARE CITY, PIECES, ATOR THE INVINCIBLE, AFTER THE FALL OF NEW YORK, ANTHROPOPHAGUS 2 aka MONSTER HUNTER and the TV-Movie SOPHIA LOREN: HER OWN STORY, in which he played actor-director Vittorio de Sica. In 1984, he directed his only film: DON'T OPEN 'TIL CHRISTMAS, a low-budget "slashing through the snow" item in which he also starred. Purdom also narrated the English version of the film SWEDEN, HEAVEN AND HELL -- which happened to be the subject of two feature articles in VIDEO WATCHDOG #145, still on sale at newsstands at the time of his death. The IMDb credits Purdom with the familiar quote, "One of the symptoms of an approaching nervous breakdown is the belief that one's work is terribly important" -- suggesting that he was the sort who preferred a lifetime of work to a "career." 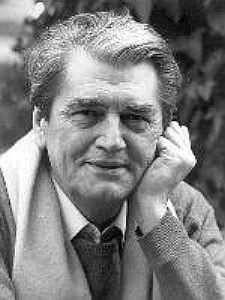 Edmund Purdom was a gorgeous man with a voice to match. His English restraint put his acting at a level above American expectations. I'm sure every woman who saw his films wanted him. I know I did. I had a passionate crush on him that has lasted 57 years. wonderful actor,a actor who you never forget once you seen him. Not only a great actor,he was pleasing to the eye. We will miss him terribly.He will be in heaven entertaining God now. He seems to take the best.Heaven must be a wonderful place with all the great entertainers that have gone on before us. Maybe they will entertain us someday? I loved him too. I don't think that he was by any means the greatest actor in the world, but what a gorgeous man he was. I fell in love with him when I was 12 yrs old, when I saw "Athena", and I am very sad to lose him. I wish him bon voyage. What a cracker! What a truly gorgeous man! I saw "The Student Prince" every year when I was growing up when it came to our little cinema in Ireland. I bought the tape a few years ago and watch it whenever I want to hear glorious singing (I loved Mario Lanza too) and look at the heartthrob of my youth! Whenever I watch it, I'm 16 again and madly in love with the prince who's sweeping Ann Blyth off her feet. What a sorry substitute the "stars" of today are. RIP Edmund Purdom. I agree wholeheartedly with the comments already given. One of my favorite works of his was as the narrator of "Padre Pio: 50 Years of Thorns and Roses". He is the only narrator that pronounced every name and place perfectly - as they were meant to be - and narrated with a wonderful reverence. A fine actor with superior looks and voice is now in Heaven. I am sad for us who lostg him, but happy for him to be in a glorious eternity. He is a gorgeous person even in his old age. I love his accent. I am deeply in love with him in the Student Prince, even now that I am in my early seventies. I watch this movie over & over again, I never get tired of it. I adore the way he embraced Ann Blyth, it's full of passion & adoration. There is only one Edmund Purdom, may he rest in peace. I love you edemund.